Six Twenty Seven: @tgiFRESHchicago presents "Ciroc de Mayo"
May is officially here and the city is starting to buzz with hot events! 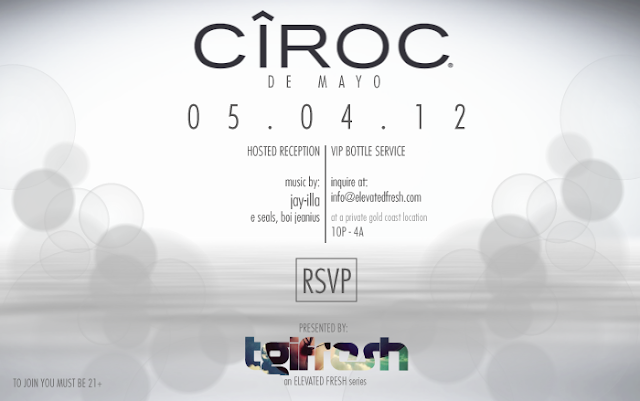 Kicking off the month in an exclusive way, @tgiFRESHchicago is hosting their "Ciroc de Mayo" celebration on May 4th. The party goes from 10p - 4a, but you must RSVP in order to have the location revealed. Sounds will be provided by DJs Jay-Illa, E Seals, and Boi Jeanius. Click here to RSVP. Tip: Early birds can enjoy the Ciroc hosted bar! Don't snooze on this opportunity to throw back some drinks on THEIR dime lol. Don't be ashamed to party on a budget.